Specializing in fresh and cooked lsland Lobster and Colville Bay Oysters. 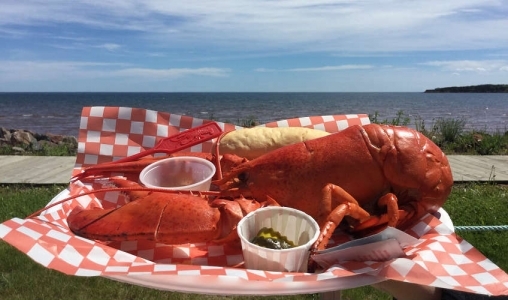 Our seafood can be taken home and prepared yourself, or you can have takeout dining on our picnic tables on Souris Beach boardwalk. We sell lobsters, fresh or cooked, oysters, mussels, quahogs - to take home - or we prepare lobster roll platters, lobster platters and oysters on the half-shell. Open June 15- Sept 30. Rossignol Estate Winery offers a remarkable variety of premium quality table wines, fruit wine and liqueurs. Visit our farm winery, vineyard and art gallery where you can enjoy the panoramic view of Northumberland Strait, sample our fine wines and peruse a wonderful selection of original artwork created by Dagny, John and friends. Cardigan Farmers’ Market with its Polehouse Café is a happy and welcoming destination. We specialize in local everything: vegetables; cheeses; meats, charcuterie; preserves; crafts and artisanal breads. We emphasize organic, whenever possible. Our home in the historic Cardigan Train Station is surrounded by a playground. The Polehouse Café provides unique meals featuring local, in season, products. Drop by to meet knowledgeable artisans and farmers and become friends with our many supporters and volunteers. Irish Cobbler potatoes were first introduced to PEI in the 1920s and quickly became a favourite because of their unique flavour. Early in the season, we hand-pick these delicious but delicate potatoes in an effort to ensure our customers enjoy the highest quality product possible. If you are in the Orwell area in late June or early July, follow our signs "NEW IRISH COBBLER POTATOES" and watch for our Leprechaun. He's your notice that we are digging Irish Cobblers. They are ready for you at our self-serve stand at 3690 Selkirk Rd. Our farm gate is open 24 hours a day, 7 days a week, July to October.